The wall decorations in Roman houses and villas have been classified into four styles according to figural content and chronology. The First Style, also called encrustation style, was popular from 150 B.C. up to 80 B.C. and can be recognised by the shiny stucco decoration imitating marble lined walls. The final result is achieved by inserting a variety of colours into different partitions for the lower panel, for the smooth paintings and for the rusticated paintings. The Second Style, also referred to as the architectural style, is characterised by the fact that for the first time the walls of the house create an illusion of being open to the outside world. This style was common between 80 B.C. and 14 A.D. and involved the depiction of architectures which extended the physical space of the house towards imaginary landscapes. The decoration does not merely attempt to imitate marble patterns but makes good use of perspective to create two or more levels of depth. These compositions included columns in the foreground and colonnades in perspective disappearing into the distance with the figure subjects or large painting,	a mythological, heroic or religious theme, in addition to small panels with doors set between the architectural features. This highly scenographic decoration seems to have been inspired by a growing theatrical taste. The Third Style, up the year 62 A.D., abandons the use of space and architectural features as the subject matter of the composition with the result that the over-all decoration loses depth. The columns, balustrades, architraves and shelves are flattened against the wall conserve a purely ornamental function. Columns are often used in an elongated form to frame large figure paintings inserted in large areas of plain coloured wall. Landscapes are reduced to miniatures inserted into a single colour background now painted in new shades of sea-green and golden yellow. The Third Style is also referred to as pseudo Egyptian because of the presence of typically Egyptian elements: lotus flowers, small stars, rosettes, coloured fillets and a band running above the skirting with details of still life scenes, gardens with bulrushes and elegant birds in a variety of poses. The wall decorations depicting large scale subjects inspired by gardens with trees, fountains, pools, small columns and birds in flight also belong to this period. From the earthquake of 62 A.D. up to the town's destruction in 79 A.D., the houses in Pompeii were decorated with Fourth Style paintings. These were also said to be in the ornamental style because the whole wall is treated simply as a free ornamental composition. The architectural features no longer have any reference to reality and are reduced to unreal designs, a mere flight of fancy in which ornamentation is often excessive. There is also frequent use of bas relief stucco work, as in the Second Style. Figure paintings become smaller or disappear altogether. Formal subjects are chosen; often inspired by philosophical or exotic themes, although we still find paintings that draw on the everyday life or news reports of important events, such as the brawl that took place in the Amphitheatre, the painting of which is now displayed at the National Archaeological Museum in Naples. The Fourth Style was a sign of wealth that typified the houses of the rich merchants of Pompeii before the catastrophe. Several experts believe that this tendency drew inspiration from the models adopted in the Domus Aurea, the imperia1 palace in Rome, built after Nero had set fire to the capital in 64 A.D. destroying many buildings. Fufidius Successus with his workshop in Via Castrice was the best known painter in Pompeii. The frescoes decorating the houses are not signed by the artist as the work was completed by more than one person, often working in series. However, experts can recognise the work of the individual groups of artists through their representation of certain details. 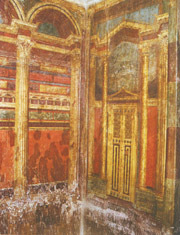 The wall paintings in Pompeii were executed using the fresco technique, by which the basic outline of the composition was prepared and the colours were then added to the fresh plaster so that, by penetrating inwards, the overall painting would last longer. This greater resistance to the effects of time and wear is due to the protection of a transparent film of calcium carbonate that is formed by the reaction between the slaked lime in the plaster and the air. This natural protection forced painters to use the encaustic technique only to fix the expensive red colour, basically obtained from mercury and known as cinnabar red, which gave a brighter shade of red than the one obtained with an ochre base. When the actual painting was finished a fine layer of wax was passed over the work.